The presidential candidate of the Peoples Democratic Party (PDP), Atiku Abubakar, has described pop singer, Davido, as the "reigning king of Nigerian music." 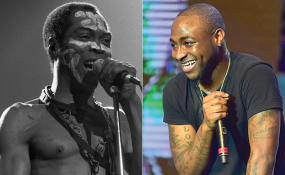 He also said late Afrobeat legend, Fela Anikulapo-Kuti, was his favourite musician. The 26-year-old musician tweeted a video of Mr Abubakar praising him during an interview. "Our incoming President knows wassup!!!! @atiku God Bless you sir!!" Davido captioned the video. In the video, Mr Abubakar described Davido as 'king' of music. "In my youth, Fela was the king of music, and believe me, he was my favourite musician. And I made sure I attended all Shrine musical events throughout the night and till morning. But of course, currently, the reigning king is Davido," he said. Davido, a staunch supporter of the PDP candidate, addresses him as 'Nigeria's next president." The father-of-three, who is the toast of Nigerian politicians, was the star attraction in his uncle, Ademola Adeleke's campaign team in September 2018. Mr Adeleke vied for the seat of the governor of Osun State under the PDP. He lost to Gboyega Oyetola of the All Progressives Congress (APC). At the time, Nigerians raised concerns over his absence from the National Youth Service orientation exercise. Davido was one of the 2,152 Batch 'B' Stream II corps members sworn-in at the NYSC orientation camp, Ipaja in August. In a comment on Instagram, Davido would later disclose that the scheme had cancelled his service.